In his wonderful book, For the Love of Physics, Walter Lewin writes: "The things we don't see at first, and take for granted ... turn out to be among the most fascinating of all phenomena." If you are reading this, the odds are very good that you have encountered the great mystery that is at the heart of practically all human music, but a mystery that seems so natural and obvious that you've never stopped to think about it. Here's a YouTube of a familiar scene. Taken with cell phone video at the Doylestown Cemetery at the end of the annual parade. Instead of a special guest singer to sing our National Anthem, the entire crowd sings in unison. What could be simpler? Men and women singing communally is one of the most basic human experiences, even in our musically inhibited culture where so many people are, sad to say, uncomfortable about using their singing voices. but I can't hear them in this recording. You might well say "Oh, come on, Dan, don't be pedantic. Everybody's singing the same thing, it's just that the men have to sing it lower than the women." Yes, I know exactly what you mean. Yes, it's true that this is the only way that men with low voices can sing along with women with high voices. But surely you wouldn't argue that these three notes, the notes the Anthem ends on, are all exactly the same. Yet, in some way, a way that's just about impossible to verbalize, they are the same. Or, in this particular context, they at least serve the purpose of being the same. Why should this be, this strange sense of same-yet-not-the-same? And why does it matter? The second question is much easier to answer than the first. It matters because everything that we generally understand to be music depends on it. And I really do mean everything: the way pitches are named, the way instruments are designed, the way music is written down, the way it's described theoretically, the way we make sense out of melodies - all of these things assume an acceptance of this puzzling psychological phenomenon. The first question - why the phenomenon exists - is much more elusive. In an attempt to answer it, allow me to very briefly summarize a few basic facts about the nature of sound, facts that you may already know and which you can learn about in great detail from a variety of sources. the simplest of repeating patterns . still a repeating pattern, but more complicated than that of the tuning fork. It's the repeating pattern that creates the sensation of pitch; the contour of the pattern gives it what is often referred to as "tone color" or timbre. Here, we're concerned only with pitch. At this point, I'd better introduce another musical term, the interval. An interval is formed by two musical tones - for example, the sounds produced by striking two keys on a piano - played either simultaneously or one after another. The term is as basic to music as the term "word" is to language. It has nothing to do with the passage of time or, in fact, with any of the other possible meanings of the word in English. Just two musical tones together or in sequence. The greater the difference in pitch between them - that is, the higher the high tone and the lower the low tone - the larger the interval is said to be. Intervals, as we'll see in the next chapter, have names, but describing them in terms of the frequencies of their two musical tones is a perfectly valid way of speaking of them too. Here are the frequencies in Hz, (more or less - crowds at Memorial Day parades don't worry about the fine points of tuning) of the three pitches of Example 4:, from highest to lowest: 277, 138.5, and 69.25. Isn't that amazing? 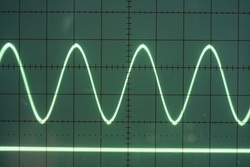 The middle frequency is twice that of the lowest and half that of the highest! That strange feeling of same-yet-different is caused by pitches whose frequency ratio is 2:1! It would be nice if this interval had a name like The Prime Interval or perhaps a Double, but it is, in fact, for reasons that will become clear in the next chapter, called an octave. Pythagoras is usually given credit for discovering, around 500 B.C., that if you pluck a string so that it produces some frequency or other and then halve the length of the string, the halved string length produces an octave with the full string length. (This knowledge probably goes back much further than when Pythagoras lived.) Pythagoras also knew that if string lengths were of other simple relationships, like 3:2 or 4:3, they produced other enticingly beautiful intervals. 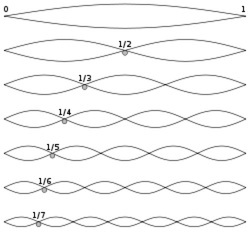 For centuries, the enticing series of pitches of Example 7, called the harmonic series, this manifestation of the mathematical world of physics as the sensation of sound, has suggested that there must be divine order to the universe, an order tying together physics and musical experience. The idea of "The Music of the Spheres" goes back at least to Pythagoras's time; the greatest of all observational astronomers, Johannes Kepler, devoted (threw away?) several years of his life trying to prove a connection between the orbits of the planets and the harmonic series in his Harmonices Mundi (1619). And today we have a completely speculative branch of physics that seeks to find a unifying theory for nothing less than everything: with its "strings" vibrating in nine different dimensions, string theory, at least to me, is a very strong echo of that same old idea. But back to our magic 2:1 frequency ratio, the octave, and it's odd quality of same-but-different, which I'll call octave equivalency. Have we answered the question of why the tones forming an octave have that quality? Their 2:1 ratio is often given as the explanation: "Oh, you know, it's because one is twice the frequency of the other." But while that is indeed an intriguing fact about the octave, and, one suspects, a very significant one, we're really no closer to understanding why the brain processes octaves the way it does. Consider the following example. Here's an octave, first played sequentially, than simultaneously. Does that suggest a familiar melody? Here's a case where octave equivalency doesn't work very well, if at all, at least not to my ears. Example 10a is definitely not a satisfactory substitute for "O Little Town of Bethlehem," even though the pitches that distort the melody so badly are in fact an octave away from the correct notes. Isn't it amazing how that one little extra note, the note you'd sing "town" on, completely destroys octave equivalency? I'm not going to try explain why this is so; I'm not sure trained musicians could thoroughly explain it to each other. Check that: trained musicians could come up with a dozen reasons in a minute, all of them plausible, none of them provable. And that is really my main point: despite the beautiful logic of the math and physics behind music theory, actual human experience - our experience of music as a psychological phenomenon - perpetually remains ambiguous and complicated, varying wildly from person to person, always defying attempts at generalization. In the past few days, I've spent lot's of time doing Google searches on phrases relating to the octave - "octave perception," for example. There's certainly a wealth of strongly held opinions out there. But the bottom line is inevitably a phrase like "...not fully understood," or "might be caused by... ."
I did find one spectacularly good essay on the subject, however: "Why Do Octaves Sound The Same?" written in the year 2000 by one Xaq Pitkow, at the time a graduate student in Harvard's Biophysics department. Do a Google search on "Xaq Pitkow Octave" and open the PDF file that Google returns. It's a highly technical and much more rigorous treatment of the issues I've tried to discuss here. Theoretical considerations aside, melodies played octaves apart (the technical way of saying it is voices doubled at the octave, or, equally valid, voices in parallel octaves) have a full, massive sound that has been exploited by the greatest composers. There is one instrument in particular whose very nature is defined by octave doubling: the pipe organ. The design of the instrument allows for an organist to create parallel octaves by depressing only one key. The monumental, gigantic sound typical of, say, the great organ works of J.S. Bach is caused by octave doubling. When orchestral strings play in octaves, they have a distinctive lush, sensuous quality. Here are two of my favorite examples. The first is a famous melody from Tchaikovsky's "Romeo and Juliet" concert overture; the entire string section is playing in octaves. It's very unusual for a composer to ask all forces to sing and play in octaves like the Memorial Day crowd at Doylestown, but here is a YouTube link to such an example, the Agnus Dei from Verdi's Requiem Mass. First, two women singing an octave apart - an eerie sound, one that's very difficult to get blended just right, and yes, that lower voice really is a woman - followed by full chorus and orchestra, still all in parallel octaves, before Verdi finally breaks away to something more complex. Playing octaves with one hand on the piano and making them sound good is hard. This technique is one of the defining characteristics of ragtime piano playing, and the ability to play octaves fluently with the left hand is the hallmark of stride piano playing. And only the greatest piano virtuosos can play parallel octaves fast with both hands. So, as a last example, here is the great American-Ukrainian pianist Valentina Lisitsa showing off her chops with Chopin's Etude Op. 25, No. 10.